Dried fruits are added to hundreds of recipes, from cakes and pies to puddings and granola. But are they really that healthy? It depends on whom you ask. For low-carb dieters, dried fruits are a sugar bomb. Nutritionists, on the other hand, emphasize the health benefits of dry fruits and their role in a balanced diet. How Healthy Is Dried Fruit? Raisins, dried figs, banana chips, coconut chips, prunes and other dried fruits are promoted as a natural, healthier alternative to sugary treats. Rich in simple and complex carbs, fiber, vitamins and antioxidants, these savory treats pack a hefty nutritional punch. The downside is that they're high in sugar and calories. Dried fruits are smaller than fresh fruits, so it's easy to go overboard and eat too much in one sitting. Additionally, some manufacturers add sugar to dried fruit for extra flavor, which is why you should always check the labels. Otherwise, these foods are packed with nutrients, especially fiber and vitamins. The key is to watch your portions. Read more: Is Dried Fruit Good for You? These energy-dense foods boast a high nutritional value. According to a 2017 review published in the journal Nutrients, dried plums promote bone formation and may improve bone density. Rich in fiber and sorbitol, they act as a natural laxative and can prevent constipation. Researchers also point out that dried plums are an excellent source of vitamin K and potassium as well as phenolic acids that support overall health. If you're trying to cut back on carbs, swap your go-to snacks for dried coconut chips. One cup has 675 calories, 7.1 grams of protein and 25 grams of carbs — including 17.9 grams of fiber and 7.1 grams of sugar; if you subtract the fiber, you get 7.1 grams of net carbs. These delicious treats also provide 18 percent of the daily recommended intake of iron and 4 percent of the daily recommended allowance of vitamin C.
As Today's Dietitian notes, dried fruits are packed with ﬂavonoids, polyphenols, carotenoids and other antioxidants. Your body needs these nutrients to fight oxidative stress and offset its harmful effects. A diet rich in antioxidants can prevent and reduce inflammation, boost brainpower, improve immune function and positively impact DNA repair. These natural compounds have been linked to a lower risk of kidney and liver damage, cancer and age-related mental diseases. Despite their high sugar content, dried fruits may help prevent diabetes and improve its symptoms. In 2017, the journal Nutrients published a surprising review of the benefits of nuts and dried fruits. Researchers have linked dried fruit consumption to improved nutrient intakes, lower body weight and reduced diabetes risk. Certain antioxidants in grapes and other dried fruits may help improve insulin response and protect the pancreas against inflammation and oxidative stress. One of the studies cited in the review indicated that grape skin extract may help preserve pancreatic function and prevent blood sugar fluctuations. Another study found that date fruit extract may reduce diabetes-related neurophysiological and behavioral changes. 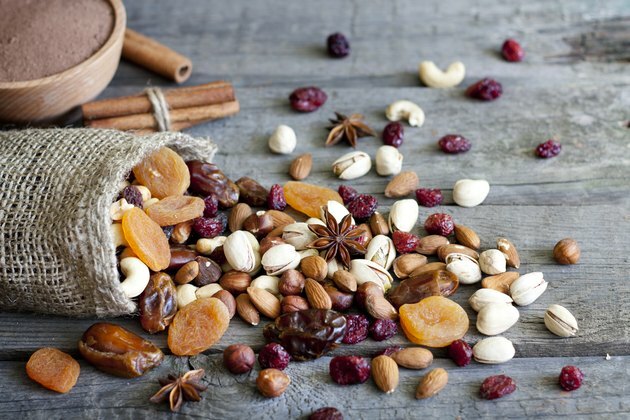 Scientists also pointed out that both nuts and dried fruits are rich in quercetin and other polyphenols with anti-inflammatory, anti-diabetic and anti-obesity effects. When consumed as part of a balanced diet, dried fruits can protect against metabolic disorders. Just make sure you choose natural varieties, with no added sugar. If you're allergic to sulfites, opt for organic dried fruit. Manufacturers often add these preservatives to dried apricots, dried mango, dried papaya, wine, grapes, maraschino cherries and other foods to increase their shelf life. Vitamin C is known for its immune-boosting properties. This nutrient can enhance your body's natural defenses, protect your skin from oxidative stress and prevent systemic infections. Furthermore, it reduces the oxidative damage induced by environmental pollutants and activates the enzymes that regulate cellular detoxification. There are plenty of other advantages of eating dry fruits, from having a better mood to younger-looking skin and improved digestion. What you may not know is that these foods can help with anxiety and depression, according to a 2016 study published in the Turkish Journal of Biology. Rats fed goji berries experienced a major reduction in anxiety levels and depressive behaviors. Their learning performance and sleep improved, too. Although the study was conducted on rats, its findings pave the way for further research. Scientists attribute these benefits to certain polysaccharides in goji berries, which have been shown to reduce anxiety by increasing serotonin or melatonin levels in the brain. These fruits are also rich in beta-carotene, a potent antioxidant that improves memory and relieves anxiety. Struggling with constipation? Prunes can help. A 2014 review featured in the journal Alimentary Pharmacology and Therapeutics indicated that dried plums are more effective at improving stool frequency and consistency than psyllium husk, a bulk-forming laxative. Dried fruits, especially prunes, are rich in both soluble and insoluble fibers that promote digestive health and keep you regular. Soluble fibers also serve as prebiotics_, feeding the good bacteria in your gut. Additionally, _sorbitol — a sugar alcohol in prunes — has laxative effects in some people. Now that you know the benefits of dry fruits, incorporate them into your diet. Even though these foods contain a lot of sugar, they're healthier than ice cream, candy or milk chocolate. Enjoy them in the morning, after exercise or between meals. Keep your portions small to prevent weight gain and blood sugar spikes.